So, I arrive in Los Angeles on Tuesday, 29th of April to get to see a few friends before the ASCAP Expo began on the 30th! Given the "warm" hospitality that Los Angeles provides, I found residency with an AirBnB, which is a service that's rapidly growing all over the world where people provide short term housing for travelers at a fraction of the cost of a hotel with the comforts of home! My host Adam, (though not on site) was VERY professional and on top of every need that I had! The place was clean and very accommodating! I was able to come and go as I pleased! It was just about a mile from the Loews Hollywood Hotel (which was where the EXPO was) which made it a very therapeutic walk to and from the event! The next morning registration began for the event and it was nothing short of a creative, chaotic sea of songwriters, singers, producers and anyone affiliated with ASCAP looking to collaborate and make great music, as well as hear from industry professionals about their success and journey in the Music business! Before I arrived to LA, I submitted online to be a part of the "Attendee Showcase" at the end of the week! Through the favor of God, Friends and Family's thoughts and prayers I was selected to be 1 of 6 songwriters out of some 400 people to perform 3 songs LIVE in front of my peers! I was SO excited and SO nervous for the opportunity! Those feelings were from the pressure to live up to the section amongst so many other amazing songwriters! After all the dust settled from the registration, they held a mixer and networking event that evening at Dave and Busters at the Highland Mall! After gauging the landscape of the madness that ensued with busy bees handing out cards (like playing poker) and chatting about possible collaborations, experiences and origin to be there, I was content to stand in one place to people watch initially but found that it was essentially a good way to meet people! My theory was that of a wildlife experience! If there is a big herd of people constantly moving and confusing for a say, "predator", it would be much easier to catch someone standing still if nothing else than to wonder why they are, standing still! With this in mind, I found it a bit easier to REALLY talk by being the "prey"! This "method" has been the saving grace in weeding out the quantity versus the quality! 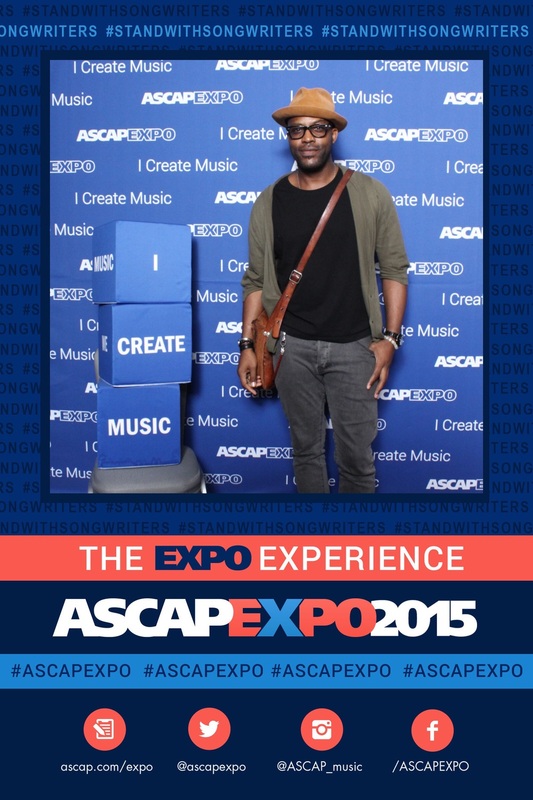 There were a select few of people I really got close to at the ASCAP EXPO, that I went on to become Friends with! The new Friends consisted of Songwriters, Producers, and a DJ! Shane (DJ/Producer), Tim (Songwriter/Producer) and Nico (Songwriter/Artist Developer) After the first day of knowing each other, we ate lunch together, went to events together and ACTUALLY went on to recorded a song together after the EXPO! We had the BEST time! There were many highlights in this already AMAZING weekend! To mention, I really enjoyed hearing from Richard Marx, Bill Withers (which is HILARIOUS), Savan Kotecha (Ariana Grande, One Direction, Maroon 5 and many more) and many other panels about the protection of our rights as songwriters and what we can do to monetize our assets in this ever-changing climate we're in! As icing on the cake with all that the weekend entailed, something amazing happened just moments before the "Writers Jam"! You see, during the week there were raffles from different companies to win anything from audio equipment, free websites to even studio time! One of the companies that was on my radar was WorldArts which was a company devoted to helping Artists and Musicians create a profile on their website to be able to submit for industry opportunities fitting the Musicians skill set! Also providing services like video production and other essential services! Just before the "Writers Jam", which included Aloe Blacc (Artist, Songwriter), Ashley Gorley (Songwriter), Andrea Martin (Songwriter, Producer) and Andrew Bird (Songwriter, Artist, Producer) there was the final drawings of the entire Expo! Keep in mind, they've called many drawings up to this point and if people weren't there, they were passed over! As I awaited to 'Jam', 2 more drawing had to be announced! The FINAL drawing was free studio time at the legendary Night Bird Studios This is the same studio whose Grammy Nominated projects include Christina Aguilera, A Great Big World, Iggy Azalea, The Band Perry and more! As Erik Philbrook announced the Studio time at Night Bird Studios, a roaring hushing came over the crowd in anticipation for the name! I was LITERALLY chewing and my next bite when it happened… MY name was called! My body got flushed with fever with the shock of this "It never happens to me" moment! There was a ROAR from the crowd as I felt as though I won a Grammy! As I walked up to the stage to accept my prize, I had a moment of clarity that this has INDEED happened! I reached into my pocket to record my peers (who I just performed for the night before) cheer me on as one of them! It felt like a prelude to something great in my near future, and a feeling that I will never forget! Check out this unfiltered reaction… OMG! CRAZY!